Why Is My Boiler Letting Out Steam? If you’ve noticed that your boiler is suddenly letting out steam, it’s most likely coming from the pressure relief valve. Not sure which is your problem or what to do next? Don’t worry, we’ll walk you through the steps of troubleshooting a boiler that’s letting out steam. Live in NJ and need a professional to inspect your boiler? Just contact us—we’ll send one out right away. Before we start, you’ll want to determine whether it’s actually your pressure relief valve that’s letting out steam. You see, your pressure relief valve is the only place on your boiler that should ever let out steam. So, if you find that the steam actually isn’t coming from the pressure relief valve, you most likely have a leak elsewhere that’s allowing hot water/steam to escape from the system. Diagram of a condensing boiler’s pressure relief valve and pressure relief drain (marked by the red asterisks). Is the steam coming from the pressure relief valve/drain? No? Then you most likely have a leak elsewhere in your boiler and need a professional to repair it ASAP. Yes? Then continue on to step 2 to determine what you should do to fix the problem. If your boiler pressure levels are over 30 psi (pounds per square inch), your pressure relief valve is letting out steam as a safety measure. You see, your pressure relief valve is designed to prevent your boiler from building up too much pressure and will automatically discharge hot water/steam when pressure levels hit a dangerous level of 30 psi (pounds per square inch) or higher. Another sign of high pressure levels is a boiler that also makes a loud humming noise when operating. Locate your pressure gauge. Your pressure gauge most likely looks something like this and is typically located on the side of the boiler. Read the pressure level. 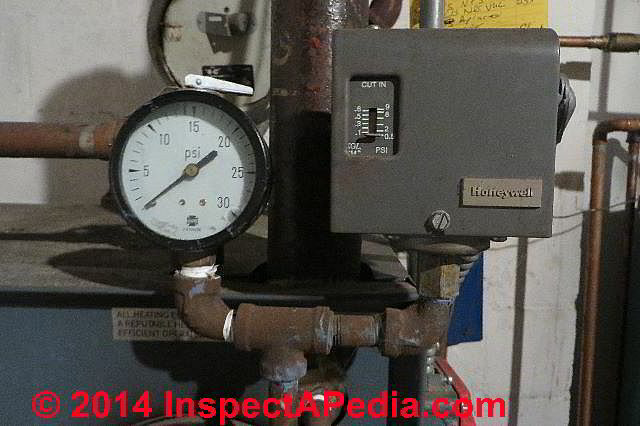 Residential boiler pressure levels should be around 12 to 15 psi. If the levels are significantly higher, this is most likely what’s forcing your pressure relief valve to open and discharge steam. Contact a professional. 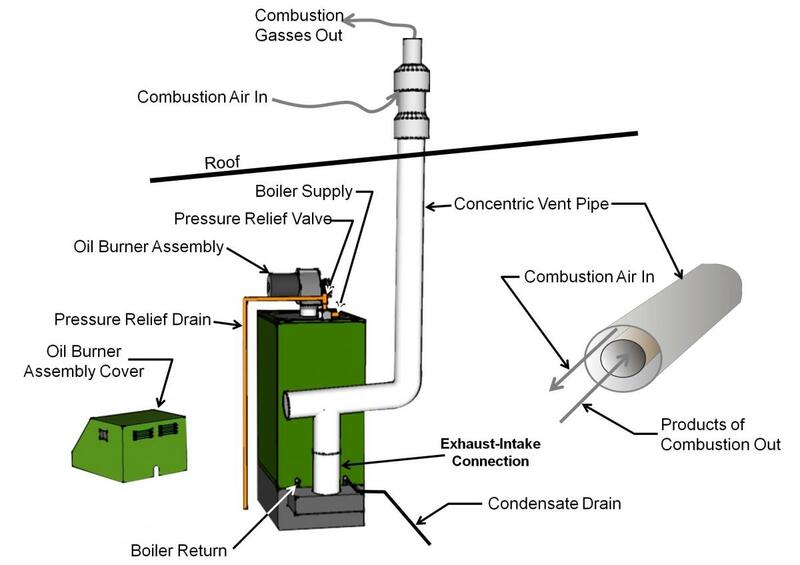 A boiler that has above-normal pressure levels is dangerous and at risk of rupturing. If you have radiators and know how to “bleed” them, you should do this immediately to lower the pressure. But if you’re not sure how to do this on your own, we suggest calling a professional immediately. Boiler pressure levels normal (between 12 and 15 psi)? Then continue on to step 3. If your boiler pressure levels are normal (12-15 psi), then your pressure relief valve is most likely bad and needs to be replaced. You see, over time, sediment from water/steam can build up in the valve and prevent it from sealing properly. And when this happens, hot water and steam will continuously escape via the valve. If you’re handy, you can try replacing the valve yourself. But unless you have experience with boiler repairs, we suggest leaving this to a professional as a DIY repair could result in third-degree burns. If you’re still having trouble with a boiler that’s letting off steam, just contact us. We’ll send over a professional who can inspect and repair your boiler for a fair price.